Intune Music Open House - FREE WORKSHOPS! / IISJONG | Singapore-Australia Lifestyle & Travel Blog IISJONG | Singapore-Australia Lifestyle & Travel Blog: Intune Music Open House - FREE WORKSHOPS! Intune Music Open House - FREE WORKSHOPS! Have you always wanted to try out something new, but don't know where to start from? I've always loved music, having learnt the piano and electone since young. There was once I was so into it that I wanted to be a radio DJ for my future career so that I can spread the happiness to everyone! I want to pick up something new because more knowledge is better than no knowledge, but what? With a long list of workshops available, there's bound to be something that you fancy. 6 pm - 650pm: Songwriting and Music Arrangement Group Workshop by Young Composer of the Year 2012 award winner Derrick Tham (Composer for songs by popular artistes, including 李圣杰 "最近" & 梁静茹“会过去的”, and 胡夏“当初”) , and Special Guest Speaker and Renowned Music Arranger Terence Teo (Arranger for songs like “如燕” by Olivia Ong and “遇见” by 孙燕姿). *1st 30 participants who register for the workshops will receive a $50 Course Voucher that can be used for any of Intune Music's courses! Want to try the vocal recording experience? No problem! The Audio Technica Vocal Recording Experience will be conducted throughout the day at the in-house recording room, from 12pm to 7pm. Participants will be able to record a song for FREE and receive their recording later on via email. Music mmos will be provided by the school for specific songs. Should you wish to record your own songs, you will need to provide the music for these songs, in the form of an mp3 file in a thumbdrive. 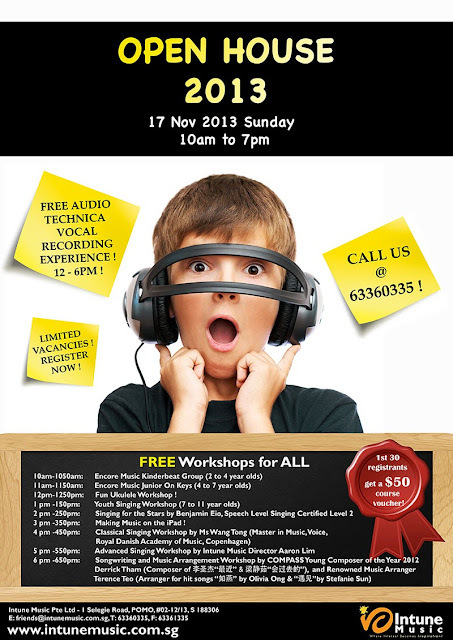 To register, call Intune Music at 63360335 or email friends@intunemusic.com.sg. SPACES ARE LIMITED!